There comes a point in your business when you may want to approach retailers with your stock. It may be your ultimate goal or you might just want to make it a small part of your overall business. When I started out, I thought it would be great to have my stock in loads of shops around the country. I have to admit, though, that I have taken a big step back from that idea. There are quite a few reasons for this and I’m trying to stick to my ‘trust your own instincts’ plan which I discussed in my NewYear, New Start blog. I’m going to share some of my reasons here, as well as some tips and some of the pitfalls and negative aspects I have experienced. This is just my own personal take on things but if you want to develop the retail end of your business, hopefully this post will give you a few helpful tips and maybe a starting point. 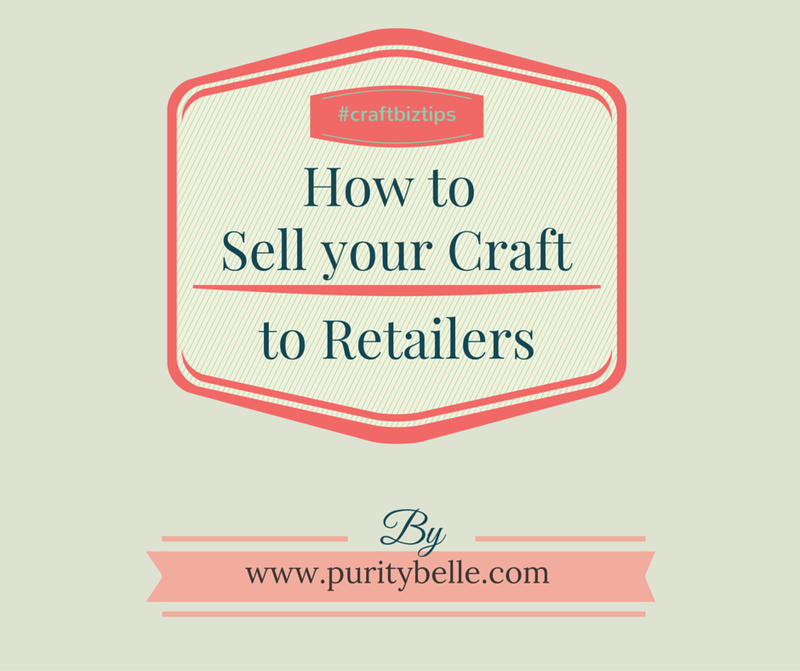 How did I get to the point where wholesale selling no longer seems that appealing? First and foremost, finding the time to approach shops, prepare stock, trying to guess what they may like was stressful in itself. Preparing yourself for a knockback is never easy although it is something you have to take in stride eventually. Secondly, the whole issue of display is really important to me and always has been. If you make your own products, you know that feeling of attachment you have J When you drop off an order of stock, you are really handing your baby over to someone else’s care and you don’t always find a shop owner who will love and promote your products in the same way that you do. I have had stock shoved behind other random products, generally knocked about and left on the shelf. All of which is bad for my business and my reputation. Thirdly and possibly the most vital, is the whole issue of payment. Many people, myself included, start out with a ‘sale or return’ policy (or consignment is the term used in the States). It’s understandable when you are new, the shop owner doesn’t know if your products will sell, it’s a risk and you may be just glad to get your goods out there, no matter what the circumstance. However, there’s a big BUT attached to working this way. It’s fraught with lots of problems. You need the cash to make initial stock but you may not see any return on it for quite some time. The shop owner has no real incentive to promote your product because basically they have gotten it for free and often won’t feel under any pressure to pay you either. There can be a lack of clarity over who is responsible if stock gets damaged – if stock is returned to you and has been damaged, you’ll have difficulty selling it through other means. Then, of course, there’s the time and effort involved in chasing up payment for stock that has actually sold. I have discussed this with quite a few people and it’s the biggest bugbear of any small business, whether craft or otherwise. Be prepared to send emails, make phone calls and generally expend a lot of energy trying to get the money you’re owed! On the plus side, I deal with a couple of fantastic shops who are fair with payment and caring of my products and also good with promotion. I will happily continue to have a relationship with them and if I can find the same balance with other shops, I’d be glad to supply them also. If you do want to pursue a goal of stocking stores, here’s a few of my tips and also a couple from Samantha aka @tweetinggoddess who kindly spent some time chatting with me. Samantha’s great advice was to be honest – explain that you are a small business and need cash flow to survive. Also, be persistent, in some cases if you persevere a ‘no’ might turn into a ‘yes’ J Look at all the different areas where your products might fit in, you never know where they might work until you try. My advice begins, as always, with price; do have a look at my pricing guide if you are unsure where to get started on this. Have a very clear idea of what it costs to make your product – you can use the formula in my post to cost your item, then double this for wholesale price. Some shops may give you a better percentage but this is really up to the individual shop and agreement you have with them. Remember that most shops will have to charge vat @23% on each item sold so this will bump up the price they need to charge, whereas most small craft businesses wouldn’t necessarily be registered for vat as we would be well below the threshold. The shop may feel that this reduces their profit if they want to keep the retail price at a reasonable level. Ok, so that’s out of the way. I think the best thing to do next is type up a clear list of products with wholesale prices and photos and list also the RRP (recommended retail price). This will give the shop owner a rough guideline for how much to charge, they may up the price but that’s entirely up to them. If you’re just starting out Vistaprint is a good place to begin with flyers, labels and cards. You can design your own and get them printed for a reasonable price. Start with local shops, approach the owner with samples and price lists. Perhaps phone first as the owner just won’t be able to give you their full attention if it’s a busy period. Be nice and if they say no, don’t be discouraged, you can always try again! When I was doing some reading on this topic, I discovered this great article on the Posie gets Cozy blog (which I totally fell in love with!). It completely resonated with me and articulated a lot of things that I was already thinking and trying to express. Don’t forget to check out the Part 2 also. I also spoke to Nadine from Out of the Blue (update, Out of the Blue is no longer in business in 2016) in Limerick. She very kindly spent some time outlining things from a retail perspective. I’d really recommend following her advice, a lot of it may seem like common sense but I know myself that you can be so focused on making the product right, it’s easy to forget other little details. Her first piece of advice is to get labelling and presentation right, this is as important as the product itself. 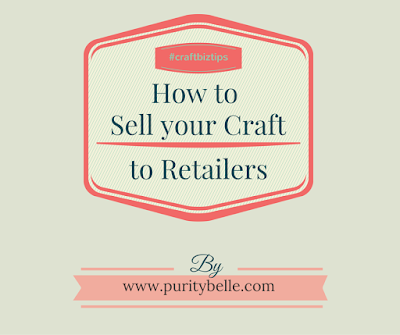 You are selling not just the craft but also yourself and a lifestyle. If possible, provide a display unit with your stock, have a little card or photoframe with information about yourself and the story of your product. Get your labelling right, make sure there is enough information about the product but not too much. Try to get your unique selling point on the label/tag/card. Always have an idea of pricing and be open to advice from the retailer because at the end of the day, they will know what sells and what doesn’t. Before you walk in, have an invoicing structure – this makes it a million times easier both for you and for the shop owner. It’s vitally important that you keep track of stock and having an invoice simplifies this. If you have a smart phone, the Invoice to Go app is absolutely brilliant. It’s perfect for small businesses and I use it all the time. It makes it very clear what stock you have sent off, what you’ve been paid for and there’s an option to pay via Paypal, which is really handy also. A big no no for retailers is if you arrive in with a big box of unpriced items. It’s just confusing and you can’t expect a shop owner to be rummaging through stuff. Keep everything clear, if you have an album with photos of your various products that’s also an option. Don’t walk in when the shop is busy – at the end of the day, the retailer needs to focus on their customers, not you, so trying to monopolise somebody’s time in a busy shop is not going to go down well! Be polite, even if you have the most amazing product in the world, retailers will be reluctant to deal with anyone who is offhand or aggressive and they’ll just have a bad association with you and your craft. Finally, when you do have your product stocked (yippee!) remember that you will need to follow up and check in with the shop owner regularly. Once a month is probably the best, going in every week is far too much. Pop in and see is your stock still looking as good as the day you brought it in – it’s natural that there will be a bit of wear and tear if people are picking things up all the time, so maybe bring some spare labels or cards and a cloth to give a quick dust. Many thanks to Nadine for all that great information, and I really hope that this blog will be of use to you! Feel free to comment as always and don’t forget to have a wee look at my shop, I'm adding items all the time and I'm happy to accept custom orders for any occasion. Delighted it's of help Mary. It's been very much a learning curve for me! Hi, very well put together article, yes I agree with all the pitfalls you outlined, and also the Positive points. I sold in this way a few years ago, and even Showed at Showcase for a few years, I mainly then went over to direct reatil with the end user. It is a bumpy road, potholes and even some nice clean straight bits along the way, wholesale is difficult at the best of times for all the points you mention, retail is also difficult, but nowadays all crafters, and Home Cottage type businesses can sell online, Via Etsy, Ebay, Amazon etc. etc. with little or no Website experience, and when a bit of confidence comes into your products and you have a Brand you can go it alone and Get a website. Nothing is easy, because if it was everyone would do it. You just have to find what works for you, and then go with it. Thanks Robbie, it is a bumpy road for sure :) I agree, there are lots of different ways to sell and I guess you just have to try and make the best decision for yourself. Excellent post, very useful information. I was planning to do something similar regarding pricing finished craft products although not specifically for selling to retailers. I have seen so many posts in Facebook groups saying take your materials and times it by 3, which doesn't allow for time and overheads. I am almost finished with my book and I was thinking about selling it in shops. Thanks for the advice. I know its a long road ahead.